Until very recently, men only had a handful of choices when choosing a metal for their wedding band. Gold, silver, and platinum are all excellent metals which make great wedding bands, but with the advent of new technologies the “big three” have been joined by a slew of new options. Options are great, but with so many to choose from, it can be difficult to know which one is best for you. 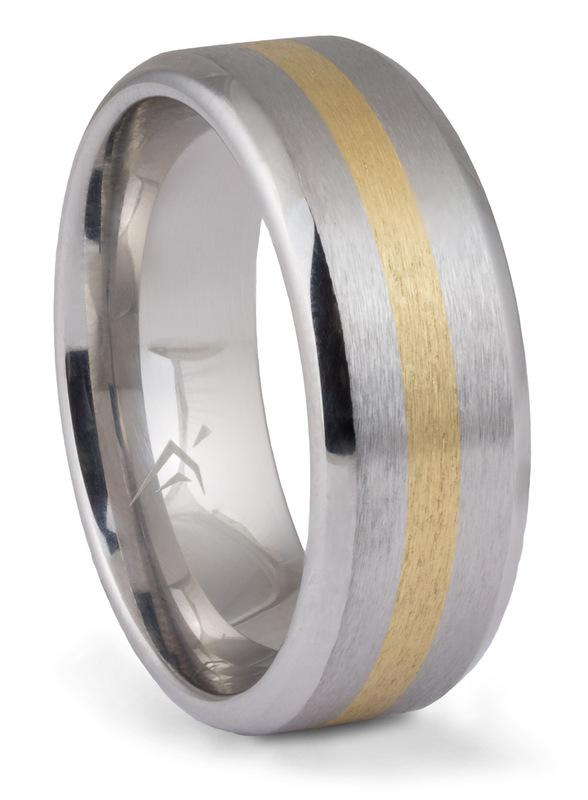 This article breaks down many of the new “alternative metals” (and non-metals) and explains why you may want to choose one for your wedding band. 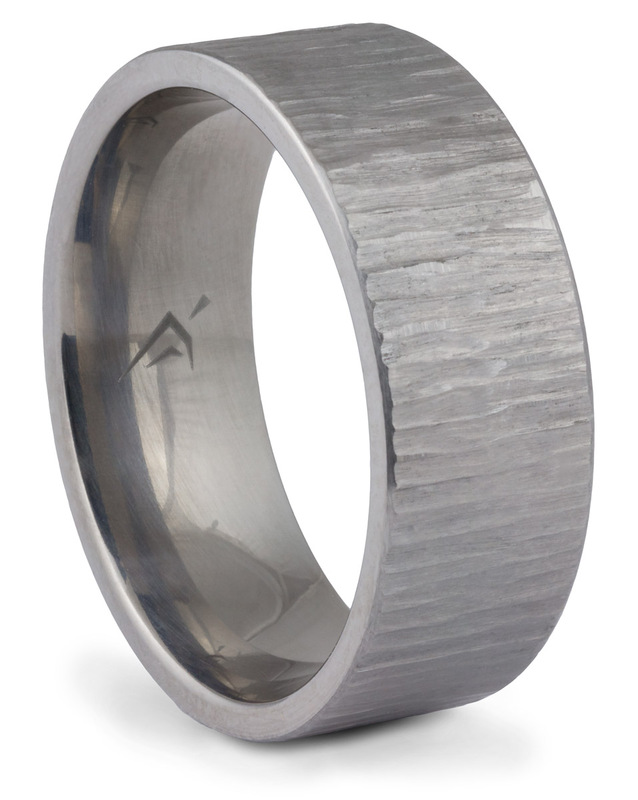 Titanium is an excellent metal for wedding bands. It is naturally silver-white in color, but it can be treated to different colors. Titanium is very light weight which is its hallmark feature and one of the reasons it is used so heavily in manufacturing. It resists scratching well, and it is both hypoallergenic and biocompatible. 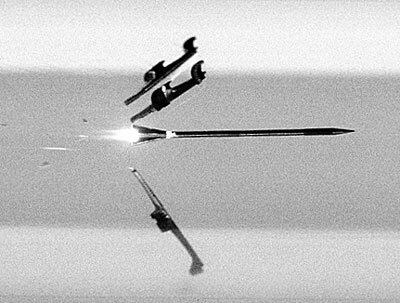 Titanium is stronger than steel yet lighter than aluminum. It comes in different grades which have different properties like hardness and ductility. There are more than 30 grades of titanium with Grade 5 (also called aircraft grade) being the most commonly used due to its incredible strength and workability. Our rings at Arden Jewelers are made from aircraft grade 5 titanium. Titanium is a chemical element with the symbol Ti and atomic number 22. It is resistant to corrosion in sea water and chlorine. Titanium is named after the Titans, mythical Greek giants who ruled the earth and personified different forces of nature. There are some potential cons to wearing a titanium ring that you should consider. Titanium rings can be cut off with a diamond-tip ring cutter, but because of their very high strength, Titanium rings are much more difficult to cut off than other metals. Also, while it is a hard metal, titanium may scratch and show signs of wear especially when compared some of the other super-hard alternative metal options like tungsten. Finally, it is difficult and expensive to resize, repair, or engrave aircraft grade titanium rings, again because of the remarkable properties of the alloy. This may or may not be an issue for you depending on who you buy your titanium ring from. At Arden Jewelers we work with manufacturers who allow us to exchange titanium (and other alternative metal) rings for different sizes for a small fee. So, “sizing” a titanium ring winds up costing about the same as or even less than sizing a traditional ring. 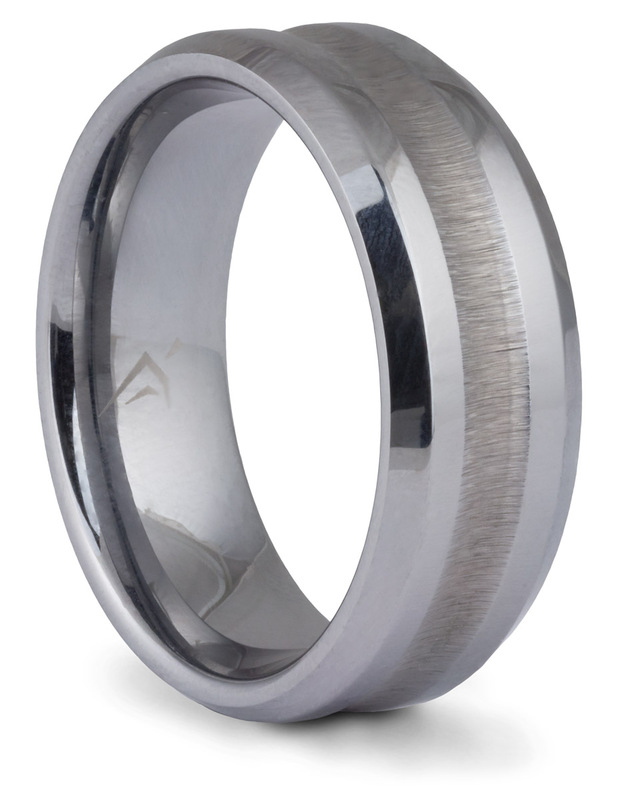 Overall, titanium is a splendid choice for a man’s wedding band. It is light weight, has the cool image of being made of aircraft metal, and is named after gods. It has a contemporary look, an affordable price, and comfortability making it an outstanding ring to wear every day. Tungsten carbide jewelry has a nice weight to it like gold and platinum, but it is much more affordable. 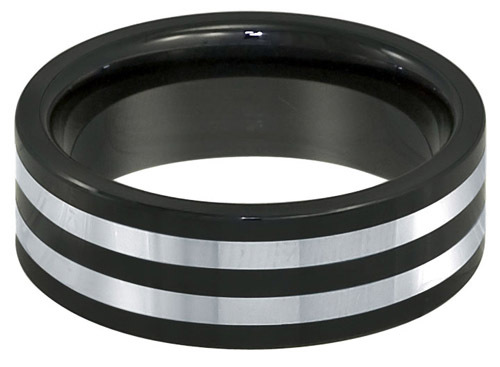 Tungsten carbide bands are extremely scratch resistant. Tungsten does not bend out of shape due to its hardness which can be a safety feature which we will discuss later. It is hypoallergenic, so people with allergies to other jewelry metals can usually wear tungsten jewelry without issue. Tungsten comes from a Swedish term meaning “heavy stone.” It is element 74 on the periodic table with the chemical symbol “W”. The “W” comes from its earlier name, wolfram. Tungsten has a high melting point at an astounding 6,191 degrees Fahrenheit. Tungsten is rated at about a 9 on the Mohs scale of hardness which is the same as Ruby or Sapphire and just below diamond (which is 10). Like these gems, tungsten is very scratch resistant and will not bend out of shape, but it will break if enough shock or pressure is applied to it. Tungsten is a dense metal which is what gives it the high quality feel of gold or platinum and also what led to its use in armor piercing tank ammunition. Tungsten wedding bands are not made out of pure tungsten. They are made out of tungsten carbide which is created by combining an equal number of tungsten and carbon atoms. 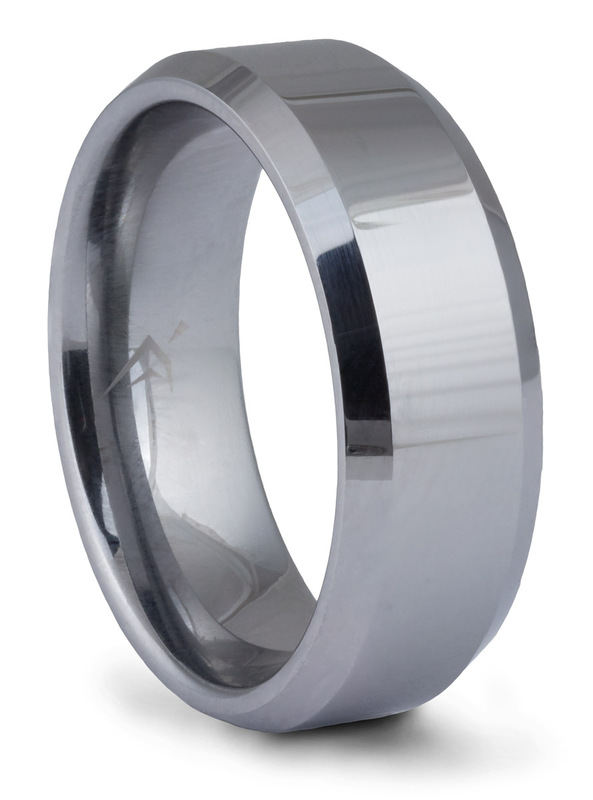 Tungsten carbide rings need to combine tungsten ore in a powder form with various binders mixed together at very high temperatures in order to make a beautifully polished and nearly indestructible piece of jewelry. There are different types of jewelry grade tungsten carbide. Higher quality tungsten carbide has a low amount of nickel and a high percentage of tungsten and carbon. Low quality tungsten jewelry has a lower percentage of tungsten. This is why there is a wide range of prices for tungsten rings which can be seen from $10 dollars to over $500. Tungsten carbide jewelry is extremely durable. It is more durable than gold, palladium, silver, or platinum. Its extreme hardness makes it resistant to scratching, but it does have brittle properties. This means that if enough pressure is applied to a tungsten wedding ring, the ring will crack or break instead of bending. This is why Tungsten rings cannot be resized. But, as with titanium rings, this may not be a big problem depending on where you buy your tungsten ring. Because they are so hard Tungsten rings cannot be cut off by standard jewelry cutters, but they can be removed in case of an emergency. The trick is to apply pressure instead of trying to cut the ring. When the correct pressure is applied, the ring breaks into pieces. This can be done with specialized tools or standard vise grips. This is in fact better for the patient in many cases because tungsten’s hardness stops the ring from bending and damaging the finger. 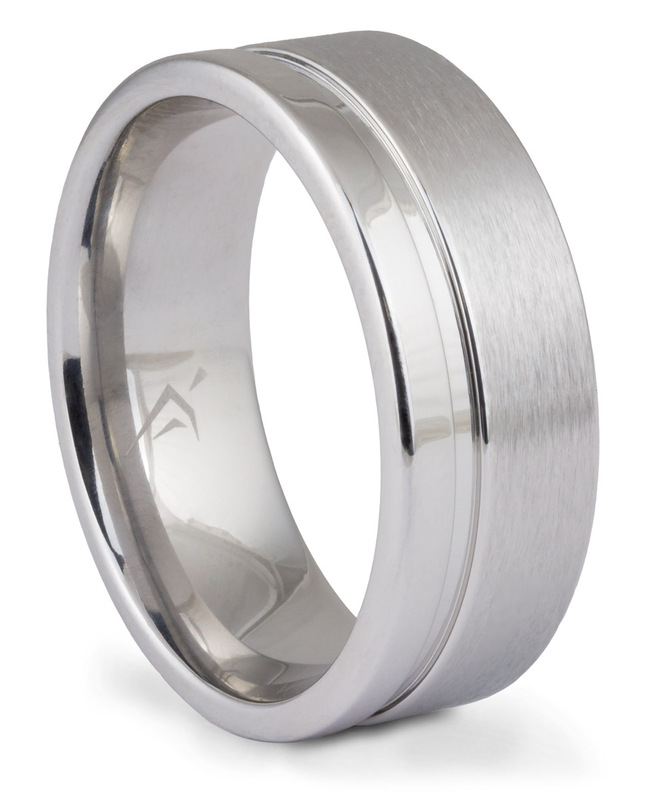 Tungsten carbide rings are an excellent, modern choice for wedding jewelry. They are scratch resistant, which makes them great everyday jewelry items and their use in tank shells definitely increases the “cool” factor. 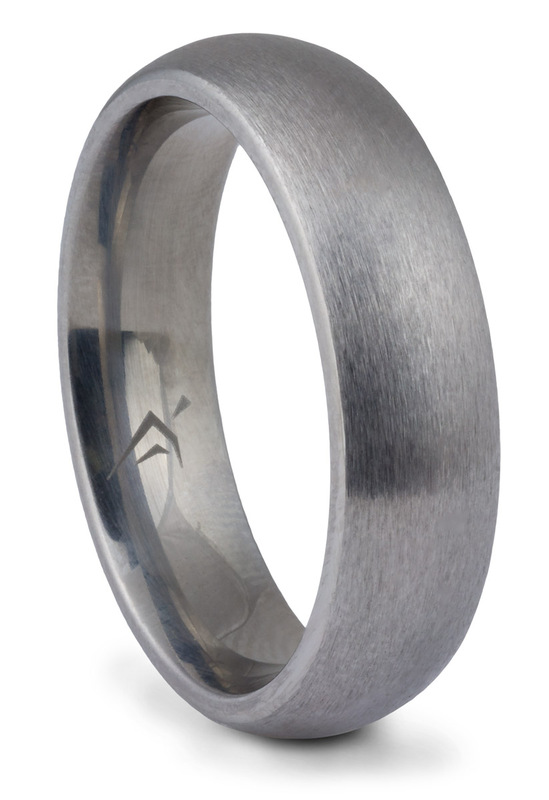 Tungsten bands are an affordable alternative to gold or platinum jewelry especially for people with active lifestyles. Cobalt chrome jewelry looks more like white gold or platinum than the other alternative metals. It is just a little lighter in color than platinum and has the reflective look of rhodium plated white gold. Cobalt chrome is harder than precious metals like platinum, gold, and silver. As a result of its hardness, it will resist scratching and wear to a greater degree than its precious metal equivalents. As a frame of reference, cobalt rings come in around 7-8 on the Mohs hardness scale which is about the same as quartz or topaz but softer than tungsten or sapphire. Like most alternative metals, cobalt chrome bands are hypoallergenic and biocompatible. But, in our experience, cobalt is more hypoallergenic than the others. So, if you struggle with allergic reactions to jewelry, you may want to give cobalt a try. Cobalt is an element number 27 on the Periodic Table. Cobalt jewelry employs the same cobalt chrome alloy from the medical industry which is used for its extreme strength and high resistance to scratching. Cobalt rings can be removed by cutting in case of any emergency just like other rings. However, like Titanium, the strength of cobalt makes it more difficult to cut off. Also like titanium, cobalt rings need to be cut in two places instead of one because they cannot be bent off the finger after one cut like precious metal rings. Cobalt is alloyed with other metals, especially chromium, to increase its durability and wear properties. Cobalt jewelry is extremely scratch, chip, and corrosion-resistant making it a great choice for an everyday wear piece like a wedding band. If you like the look of white gold but not the price tag, cobalt may be the perfect alternative metal for you. 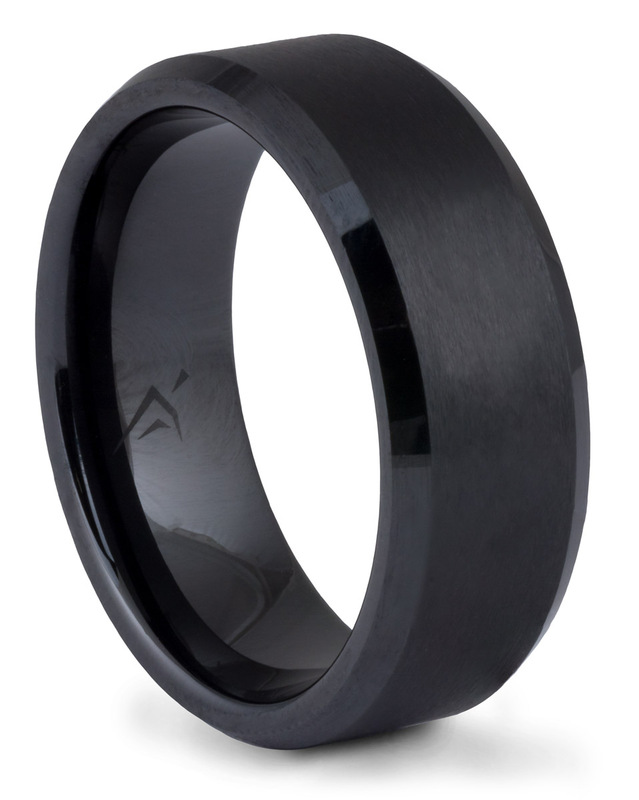 Carbon fiber wedding rings are popular with the modern, stylish ring buyer. 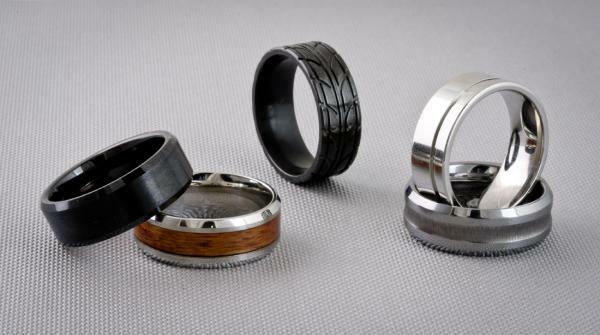 Carbon fiber rings are certainly the lightest ring on the market, but they are also very strong. This combination of high strength and light weight is what makes carbon fiber so popular with high tech designs from space craft to high performance sports. Carbon fiber is a symbol of cutting edge tech. Carbon is the basic building material of our universe. 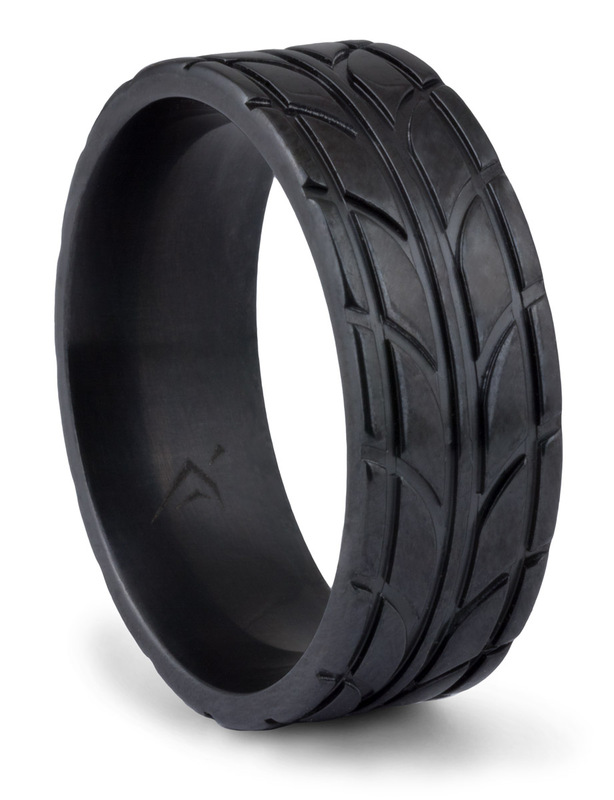 It is element 6 on the Periodic Table with the chemical symbol of “C.” Carbon fiber rings are scratch-resistant and hypoallergenic. It is perfect for those who are allergic to any metal. This is because carbon fiber is not a metal at all but a combination of several thin fibers that are bounded together and twisted together. This is then woven into fabric. The density of carbon fibers is low thus making it suitable for making lightweight materials. Carbon fiber is relatively easy to maintain. You can clean it by washing with water or non-abrasive soap. Like titanium and other alternative metal rings, carbon fiber cannot be sized, so keep that in mind when choosing where you buy your ring (at Arden Jewelers you can exchange your ring for a different size). 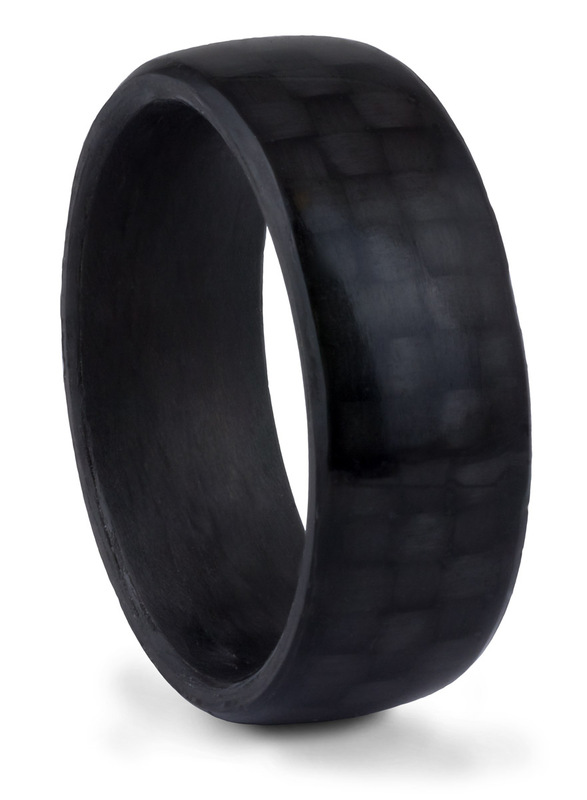 Carbon fiber wedding bands display high style and strength setting the wearer apart from the crowd. Ceramic jewelry, like many of the “alternative metals” is lightweight, hypoallergenic, and tarnish resistant. Jewelry grade ceramic is also called titanium carbide. Ceramic titanium carbide is very hard and used as a heat guard in space shuttles. Ceramic jewelry measure around 9 on the Mohs scale of mineral hardness which is comparable to tungsten carbide and sapphire. Ceramic can be polished to a high shine, and it is very durable. You can clean it by wiping the jewelry with a damp cloth and drying it with a lint-free cloth. Ceramic jewelry is strong and scratch-resistant, but it can chip. Like tungsten carbide, ceramic’s extreme hardness makes it impossible to cut off using standard ring cutters. However, also like tungsten, ceramic rings can be shattered in an emergency by applying pressure. Special tools are available for this purpose, but standard vise grips have also been used effectively. As you may have guessed, the same caveats about ring sizing tungsten (and other alternative metals) also apply to ceramic so be sure to ask about sizing exchanges before you buy. Ceramic jewelry generally has a smooth glossy finish. It also can be made in almost any color possible. Ceramic rings are available in stunning black to very creative colors and can be found in a variety of finishes from matte to highly polish. Overall, ceramic jewelry is a great option with space-age tech for someone who wants a non-traditional wedding band. Zirconium is a natural element which begins with a silver color. Zirconium is then heat treated and exposed which oxidizes it to a rich black color. The oxidization layer feels much like a ceramic and is as hard as sapphire. The black color is permanent. It does not fade, tarnish, or otherwise change color. The permanent black color is a unique feature in the jewelry world as most black metals are the result of plating or antiquing which fades overtime. Zirconium is currently the only permanently black jewelry that is workable enough to allow the setting of diamond or other gems. Ceramic is another permanently black option (it can even be made a more pure black than Zirconium), but it is too brittle to set gems in. 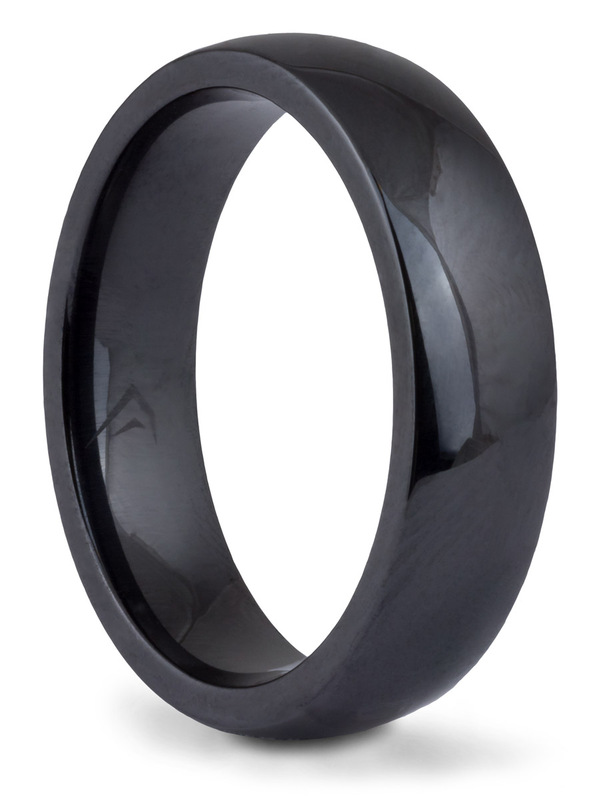 Black Zirconium rings are shatterproof, but they can be cut off of the finger if necessary. However, like titanium and other alternative metals, it is much more difficult to cut a zirconium ring than a precious metal ring and two cuts are necessary since the material is so difficult to bend. Again like other alternative metals, Zirconium rings cannot be sized, so you will want to make sure you can exchange your ring for a different size in the future (like you can at Arden Jewelers). Zirconium has the symbol Zr and the atomic number 40. Zirconium has a super high resistance to corrosion. It is biocompatible and nontoxic. It has been used in the space, aeronautic, and even the medical industry. Zirconium is not to be confused with Zirconia, as in Cubic Zirconia (commonly called CZ), which is a very different, man-made material. The black layer of Zirconium can be crafted to create two-toned designs, and it pairs well with gold and other materials for a very creative look. 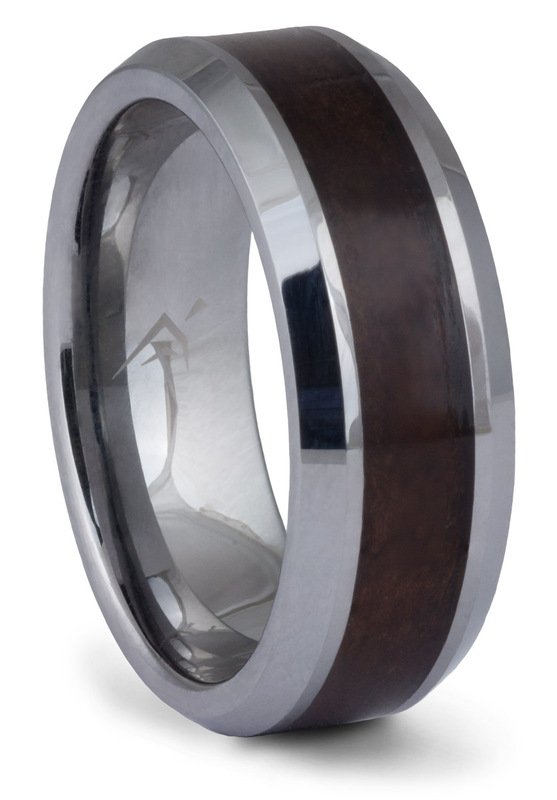 You may not think of wood when you are considering an alternative metal for your wedding band, but today there are some excellent options that are definitely worth checking out. Bloodwood makes stunning rings that are strong, scratch resistant, hypoallergenic, lightweight, and very comfortable to wear. Bloodwood comes from any of a number of hardwood trees with deep red timber. It is extremely dense and finishes to an exceptional, lustrous, red surface. 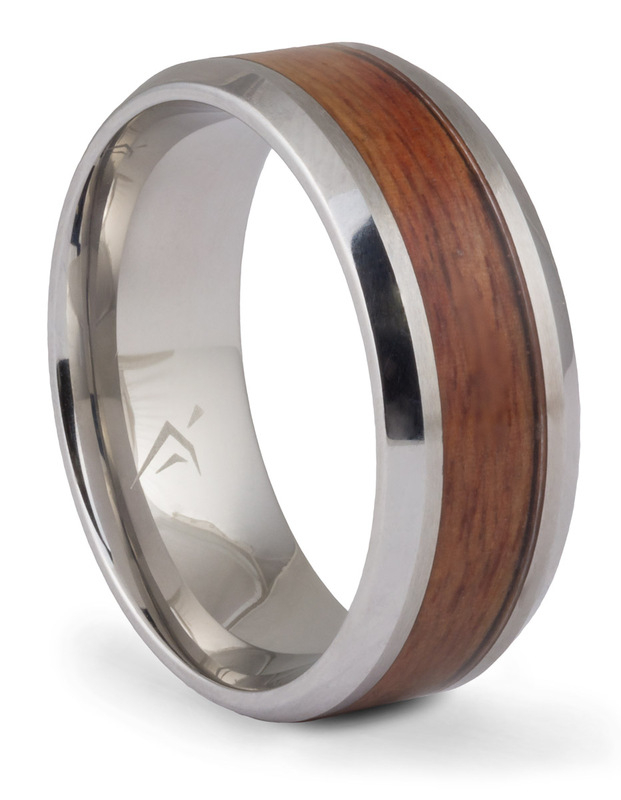 Burl wood rings are another creative use of nature and modern design. Burl wood is created when a tree growth has deformed. This fashions a beautiful, one-of-a-kind pattern which is very hard. Burl wood is often used in tobacco pipes due to its density, fire resistance, and distinctive patterns. It can be worked to a very smooth, polished, and durable finish which makes it great for everyday jewelry like wedding bands. Many rings are made with inlaid bloodwood or burl wood. Titanium, cobalt, sterling silver, and other metals can be inlaid with wood to create a modern look with a touch of nature. As you can see, you have a lot of choices when deciding on a metal for your wedding band. We hope this article has helped clarify your options. Here is a quick summary chart to help you compare the different materials we discussed. As always, if you have any questions or you would like more personalized advice, please don’t hesitate to contact or visit us today. We have a great selection of both alternative and precious metal men’s jewelry in our store and online. Plus, you can buy with the peace of mind that you are getting high quality jewelry from a company that will stand behind it. As we have seen, there are a lot of special concerns with alternative metals like varying material quality (e.g. the nickel level in tungsten or the grade of titanium) and the impossibility of sizing. These issues make it more important than ever to buy from a trusted jeweler with years of experience and a commitment to putting customers first.